More than man’s best friend, dogs are leading the charge in bed bug detection and with good reason. Canines have an incredible sense of smell that allows them to detect the presence of bed bugs even when they aren’t visible. While trained bed bug inspectors are skilled at identifying bed bug infestations, they are limited by their visibility. 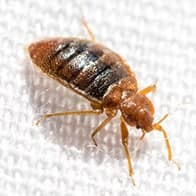 Without lifting up a carpet or moving beds and furniture around, they cannot accurately identify a bed bug infestation. Trained bed bug dogs can. At Pine State Pest Solutions, our dogs were rescued from the Florida Humane Society, and trained at the Florida Canine Academy by legendary trainer Bill Whitstine. Our expert team of bed bug dogs and handlers travel across the state of Maine and are ready to help you find out if bed bugs are a problem in your home or business. Dogs have shown to be extremely accurate in detecting and pinpointing the location of bed bugs. Dogs are trained to work for food and love—not profits. Bug detection dogs generate much quicker and more accurate results, meaning less expensive remediation costs. Reasonable certainty of the presence of bed bugs. Schedule Your K-9 Bed Bug Inspection Today! Bill is a Certified Master Trainer, specializing in the training and certification of bed bug, bomb, drug, money, weapons, termite, mold and accelerant detection dogs. Bill has been featured on over nine shows, including segments on The Animal Planet, Discovery Channel, HGTV and Extreme Makeover.